Hi, everyone! It's hard to believe how quickly this year has gone. It's the holiday season already! We've already celebrated Halloween, and Thanksgiving is later this week. I've been getting plenty of business already in my two bake shops, Barkery and Biscuits, and Icing on the Cake, and feel sure I'll get even more just before Thanksgiving since people like to have sweets for their own dinners--and will also give healthy treats to their dogs in celebration. What am I doing for Thanksgiving? I'll be cooking a turkey dinner, and those dining with me will include my brother Neal and his girlfriend--and my assistant--Janelle Blaystone. Also, Dr. Reed Storme, the veterinarian with whom I have a really fun relationship, with join us. And our dogs, of course--my Biscuit, a toy poodle-terrier mix, Reed's Belgian Malinois Hugo, and Janelle's Labrador retriever Go. And yes, I'll have sweets from Icing there for dessert, as well as treats from the Barkery for the dogs. And of course I'll be hoping that nothing nasty happens in our town of Knobcone Heights during the holiday season. I seem to be getting involved with helping to find the bad guys in quite a few situations that often involve murders, and I really don't want that to happen again, especially now. Anyway, guess what. I'm already so jazzed about the holiday season that, as part of the Killer Characters Seasons Readings, I'm going to give away a copy of PICK AND CHEWS--the most recent book that describes how I helped to solve yet another one of those murders in Knobcone Heights--to one person who comments on this blog post. The person who writes my stories, Linda O. Johnston, says she will have her own dogs pick the winner on Thanksgiving Day, and that the winner needs to live in the U.S. She requests that people include their email addresses in their comments. So--good luck to all of you. And Happy Thanksgiving! I do try to be careful. Honest, I do. It sounds like you are going to have a lovely Thanksgiving! Thank you for giving away a book. Yes, I'm looking forward to Thanksgiving. Hope you enjoy yours, too. I find it hard to believe it is now Thanksgiving and Christmas is coming fast. Happy Holidays. Sounds like great cozy mystery. Happy Thanksgiving. Thanks, and Happy Thanksgiving to you, too! Our dogs like to keep busy that way. Dachshunds are fun! Glad you enjoyed the book. And a Happy Thanksgiving to you, too, Terri! The dogs on the cover look like great fun! They are definitely great fun, Libby! Since I can't be with you in Knobcone Heights to celebrate Thanksgiving, maybe I can share one of my favorite recipes for the holiday season. Everyone thinks of the standard green bean casserole as being the dish to make. Well, I kick it up a notch with my Green Bean & Shoepeg Corn Casserole (recipe below). Maybe you will try it this year and let me know how it goes. It disappears at our table faster than you can say "whodunit"! 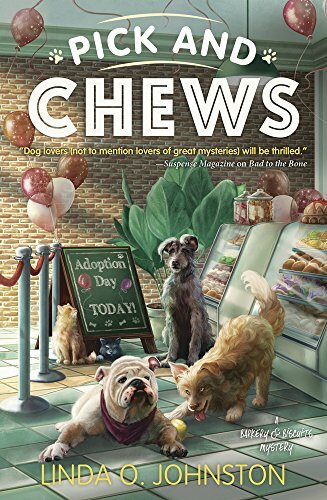 Always LOVE your covers, but I really do think that the cover of "PICK AND CHEWS" is my absolute favorite. Being one that worked for a while seeing that pooches got adopted it just jumps out at me. I have this book on top of my TBR list and would love the opportunity to read it. Thank you for the chance to win a copy! Wow, thanks for the recipe, Kay! And delighted that you like the PICK AND CHEWS cover. Happy Thanksgiving! Thanks for writing such fun stories! And Happy Thanksgiving back, Jana Leah B. I'm answering this time to thank you for your compliment to my writing! Happy Thanksgiving! Email is jl_minter@Hotmail.com My apologies if this posts twice, I wasn't sure if it submitted the first time. Didn't see a second post, Jaime. Happy Thanksgiving to you, too! That's so great, Petite. Hugs to Bogie, and we hope all of you have a great Thanksgiving and Hanukkah! Same back at you, taurus! Happy Thanksgiving! Would love to read "Pick and Chews", great cover and love the animal storyline. Thanks, Dianne. Happy Thanksgiving to you! You're welcome, and Happy Thanksgiving to you, too! We do happen to like Lindas. Happy Thanksgiving to you, too! Happy Thanksgiving to everyone! This one sounds really good - I love books with dogs in them. Thanks for the giveaway. Thanks so much for commenting--and entering--everyone! We're probably not going to continue to reply individually, but we really appreciate your visiting us. We will email our winner on Thanksgiving or the day after. Have a wonderful holiday! I'd love to win. I probably have most if not all of the earlier ones in the series. I hope you have a wonderful Thanksgiving. I will be celebrating with my 2 rescue beagles.